Remake globalization to preserve it for future. French far-right leader, Marine Le Pen, was apparently referring to Brexit and Trump’s victory when she stated “2016 was the year the Anglo-Saxon world woke up. 2017, I am sure, the people of continental Europe will wake up”. These two events signify the backlash of the western working class against globalization, which facilitated the unhindered movement of the three ‘M’s – Men, Materials and Money, which they feel is working against their interests. Around thirty years ago, the fall of the Berlin Wall, a watershed moment in history, heralded the retreat of communism and the advance of the free market capitalism and globalization. The globalization, which reduced various barriers, narrowed down the distances and softened the national boundaries, brought together the entire humanity as never before, transforming the world into a sort of global village. But is globalization really such a wonderful phenomenon which proved to be a panacea to the problems faced by the humankind? It is a well-known fact that big business corporations, which assumed the mantle of running the globalized world, always ensure that the words such as human welfare and social justice don’t exist in their dictionaries. Globalization has enabled them to source the 3 ‘M’s from where they are cheapest and sell their produce where they fetch the highest price, making super profits in the process. They even have done away with the human element to a great extent by opening fully automated smart factories, where they employ only a handful of people. Therefore, the biggest beneficiaries of the globalization are the investors of the big business corporations, who accumulated enormous wealth, which resulted in the concentration of economic power in the hands of a select few. The people in the developed world found their opportunities snatched away by the developing world, where the labor is relatively cheaper. They also found their markets inundated with the cheaper goods manufactured in the emerging economies. Globalization has allowed the third world countries such as China, India, Mexico and Malaysia to leverage upon their core competencies to make rapid strides in economic growth. But even in these countries the impressive growth in the GDP numbers is accompanied by very little growth in employment opportunities. Cost cutting, downsizing, consolidation, corporate tax cuts and bailouts, which became the buzzwords among the business circles, benefit only business corporations causing damage to the livelihoods of the working class. Is terrorism the darker side of globalization? Globalization opened doors for the people from the third world to their lands of dreams. However, some of these migrants, especially from the ultra-conservative, authoritarian Muslim world, found it difficult to integrate into the mainstream societies of their host countries. This incompatibility, coupled with the western interventions in the Muslim world, brought terror to the very heart of the western world triggering a wave of Islamophobia. 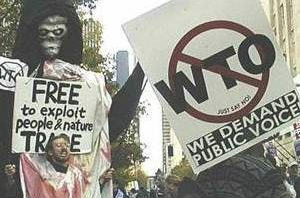 An increasing number of westerners started perceiving this as a darker side of the globalization and feel that the counter-globalization, advocated by the right wing, is the only way to defeat terrorism. The common man, who felt the pinch of jobless growth and unceasing terrorist violence, voted for building walls and imposing tariffs. Protectionist policies will invariably have a domino effect. When one country erects protectionist barriers the others will definitely follow suit, and the net effect of these actions is a gradual de-globalization. The big business corporations must realize the fact the globalization is like a golden goose, which fetches good monetary rewards as long as they run their businesses with a human touch. Running businesses sans human touch is akin to greed induced killing of the golden goose called globalization. Corporate bigwigs and the state heads must also understand the fact that money and technology, which are the creations of the humankind, should be subservient to the humans and must contribute to the welfare of the entire humanity. Unfortunately, things are happening the other way round, heralding an extremely precarious situation which is akin to ‘tail wagging the dog’. The working class in the developed world and the emerging world appear to be equally discontented with the phenomenon of globalization. However, unfortunately they don’t have any avenues to express their discontent except protesting in front of the venues of global economic summits, where no one even listens to them. The opinion makers, who are disconnected from the reality on the ground, are busy blaming the right wing. They are unmindful of the fact that the globalization is being misused by the corporates and politicians to promote their narrow self-interests, and by doing so, they made the situation ripe for the right wing to thrive, which is potentially disastrous to the humanity. The need of the hour, if globalization is to survive, is to remake it to work for everyone. The human society can no longer afford the jobless growth and any growth in the GDP must be accompanied by a parallel growth in the jobs. Technology should be utilized only where it contributes to the maximum good for the maximum number of people. In the words of Jaggi Singh, an anti-globalization and social justice activist: Our struggle is about changing the world. It is about creating structures, institutions, frameworks, communities and neighborhoods that are based on the values of social justice, mutual aid, solidarity and direct democracy. These are the golden words that must be followed by the entire humanity to save peace and ultimately save the globalization itself. For that to happen, the most important prerequisite is providing voice to the voiceless and involving all the stakeholders, not just corporates and politicians, in remaking globalization. 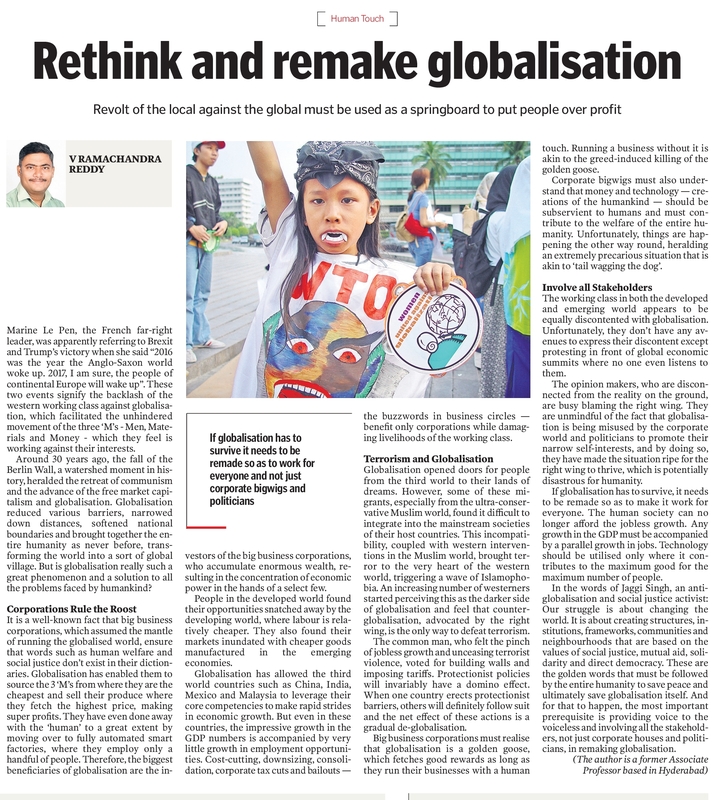 This article was published in the editorial page of Telangana Today newspaper on 15th Feb 2017 with the title “Rethink and Remake Globalisation”. 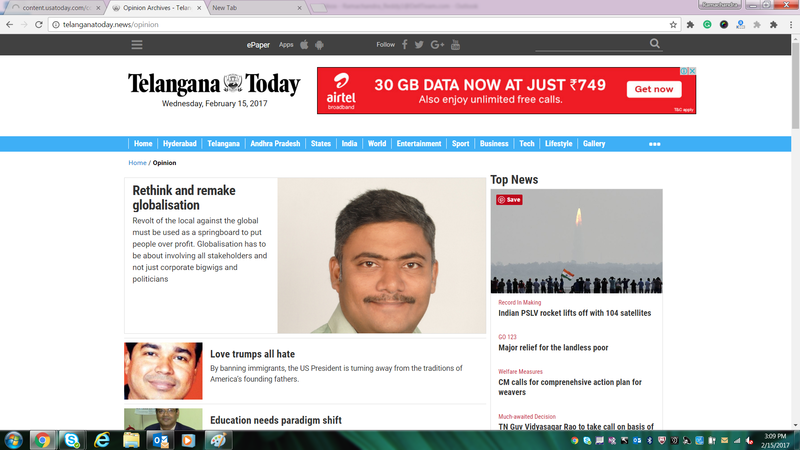 This entry was posted in World and tagged globalization, human touch, working class on February 24, 2017 by Dr. Ramachandra Reddy.